Los Angeles, CA (February 3, 2011) – Expo Line construction crews began installing components of pedestrian and vehicle crossing gates today, the first of many elements designed to help ensure the safety of motorists, pedestrians, cyclists and the more than 64,000 daily riders expected to use the light rail line by 2030. Pedestrian crossing gates and vehicle crossing gate components, including crossing arm motors and intersection lights, will be installed over the next month. Crews are scheduled to return to the intersections to install crossing gate arms in the spring. The crossing gates are designed to alert pedestrians and motorists of approaching trains and prevent them from crossing the tracks until it is safe to do so. The same operational safeguards have been used on the Metro Gold Line, which has been providing transit service through residential communities and near schools since 2003, and is one of the safest light rail lines in the country. “This is an important construction milestone that marks our commitment to safety. These pedestrian and vehicle crossing gates are some of the state-of-the-art safety features that will be implemented on the Expo Line,” said Richard D. Thorpe, Exposition Construction Authority CEO. I vividly recall the old RR crossing signs and lights along Exposition Blvd. when the original wooden grade crossings were there. It’s pretty funny to me to see the new light standards in the same place, now with the lightrail-constructed right-of-way. 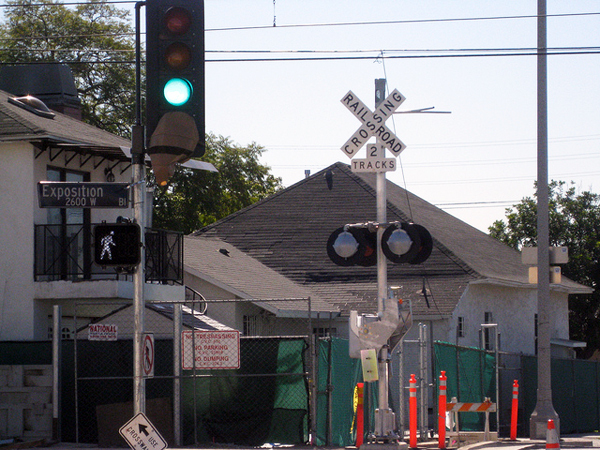 To this day there is still a RR crossing sign on Barrington Avenue at the intersection of Exposition in West LA. I’ve been meaning to snap a photo for some time. I think it might be the only one left. Progress! Any news of progress on the completion of the first phase of the Expo (Aqua) Line is good news. And by the way, I still love the sound of the name, the “Aqua Line.” Expo Line sounds nice. “Aqua Line” sounds very L.A. When will Metro learn to add these safety components to the Metro Blue Line??????????? I don’t understand why it has been more than 20 years & yet Metro has not added any safety components to the Blue line especially on the Washington Street segment. This concern needs to be brought up at the council meetings!!!!!!!!!!!!!!! I agree with Victor C. Especially with crossing gates. The blue line street running crossings on Washington are the least visually obvious to drivers and pedestrians. And not only are crossing gates more safe but they also allow the train to be more efficient and therefore improve the level of service because it eliminates delays at intersections, which slow down travel time and drive away potential riders. There is a reason the Pasadena gold line is faster than the Eastside gold line. Unfortunately the crossing gates may only be at a few intersections that are on the RR row. I really hope they reconsider such a limited use of them. There are some pretty ridiculous non-gated crossings like the crisscross at gramercy Pl, the freeway on-ramp at 28th, and the mess at Washington/Flower as examples. Also please give the trains signal preemption so that the train is not sitting at lights while cars get to go through. It really does not make much sense from a transit standpoint at all. The Washington Station used to be one of my go-to stations. You have to be pretty obvlivious to everything around you to get hit by a Blue Line train ANYWHERE, including Washington. I don’t understand why you’d need anything? Light is red, don’t drive through it (as a driver). As a pedestrian, when you see a BIG TRAIN next to you, don’t walk into it. Super easy/simple. The trains are moving so slow right there that there really is no excuse other than totally not paying attention to get hit. I was in Portland recently, and they have areas with much less safety precautions for at-grade rail. I wonder if they have the same rate of accidents. That’s exciting; I would love to see that Barrington RR crossing sign. I would also have to agree with Jared. You can’t possibly think Washington Blvd. should get or have crossing arms, bells or lights. You tend to need that at intersetions or other crossings where it’s generally not very busy. Contrary to what’s been said here, the blue line has exactly the same equipment at numerous points along its right-of-way. Most of the people being struck by the train have, in fact, been breaking the law by either trespassing, loitering, driving around the arm gates where they do exist, speeding, jay walking, running lights or stop signs. Don’t break the law? Don’t break your skull, it’s that simple.